Put some mud on it. Looks much better than another one which was suggested on Facebook. See attached. YUCK! 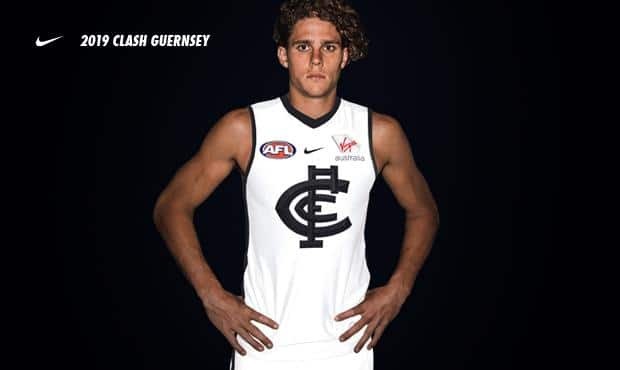 We should hardly ever have to wear a clash jumper if the AFL stuck to their guns and insisted that new clubs kept their original approved jumper we would have less colour clashes. For instance... Freo were originally approved to wear a white jumper with purple, green and red sections. If AFL did not approve them changing to a mainly purple jumper we could have worn traditional Navy against them. Apparently the attachment quota has been reached???? I have said the exact same thing. Freo have changed their jumper over the years and from a distance they look navy. WCE also had their original jumper as a royal blue with yellow and they now wear dark blue and yellow for home games. Actually even Melbourne have changed theirs over the years too. They wore a lighter blue and red jumper and now wear navy and blue. One thing I will give Geelong credit for, and it is the only thing, is that they will often wear white shorts for home games and we have not had to wear an away strip against them. Navy Blue shorts and socks to go with it at least ? As long as CFC wins games who cares. I hope they'r Dark Navy Blue. White sox will look bad. Guess whose mum has got a whirlpool? I love the fact we have the best looking jumper in the comp...that's what I have heard and keep hearing from opposition supporters. We are Dark Navy Blue with a white monogram. Period!